In May 1999, Milton Friedman gave an interview to Forbes Magazine back when it was an actual magazine. It was an auspicious time, of course, and what he had to say then resonated, though as much in an unflattering way as that which might reflect well on him. But we are not commit the logical fallacy so often deployed to try to discredit an argument; being wrong about some things doesn’t make one wrong about everything. As to the bad, during the interview Friedman thought there was no recession on the horizon, and maybe there wasn’t at that moment (the official dot-com recession was just less than two years ahead), but more so that he saw Japan moving toward full-blown recovery. It was somewhat related to the first prediction, as he said, “There’s nothing to prevent Japan, a year or two from now, from being in a boom.” That, Friedman worried, might end up having negative effects on the US as the Bank of Japan would surely be raising rates if that occurred. 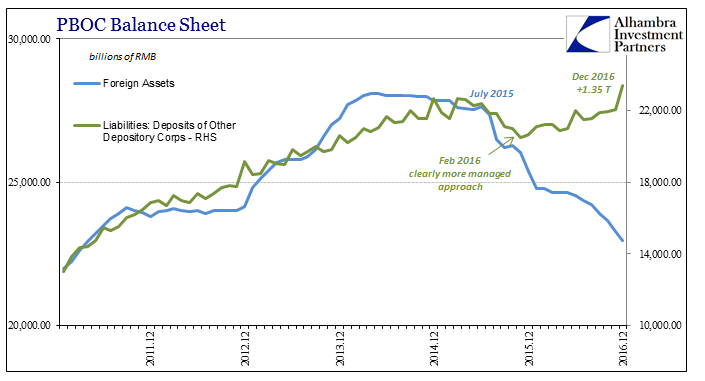 We’re in a period like the 1960s, when no one paid any attention to the money supply. Then we got inflation. By the 1980s everyone was obsessed with the money supply. Now they’re forgetting again. And it will turn around and surprise them. That it did, and then some. For the longest time, inflation in the US (as well as Europe, but not, as he suspect, Japan despite the Bank of Japan finally heeding his recommendation about “base money” expansion in the form of QE) behaved as he proposed. 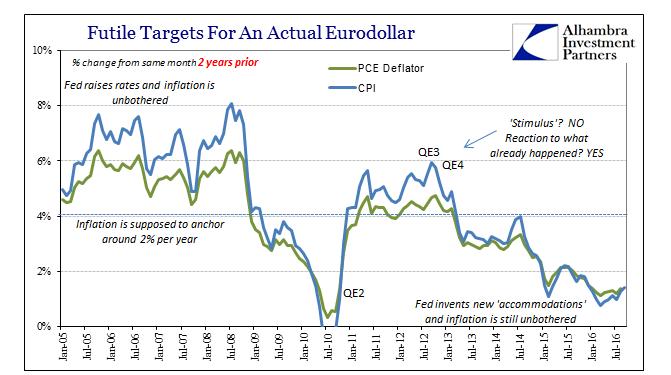 In the middle 2000’s, both the CPI and PCE Deflator remained well above the Fed’s then-implicit 2% target no matter what Greenspan did or proposed. He raised the federal funds target 17 times in two years, to conspicuously no avail. Instead, the FOMC was left muttering about some “global savings glut” while at the same time discontinuing (rather than researching) the drastically incomplete M3 supply measure, fulfilling Friedman’s warning in the fullest. The consequences of such global “dollar” expansion were not strictly local, though by Friedman’s frame of understanding they should have been. Beyond the US, Europe, or Japan, there were “dollars” practically everywhere, as were there, not coincidentally, so many attending economic “miracles.” The prime example will always be China, not just for the seemingly good times that were had in the middle 2000’s, but also, unfortunately, the naked expression of just how bad the unwinding of them might become. It is that last part where Freidman’s warning so greatly applies, though it is clear he never would have made the connection. For him, “base money” was bank reserves, the same as it was in the early 1930’s that caused him to fix the blame for the Great Depression on the Fed. It should have been clear by the Japanese experience alone throughout the 1990’s that there was a lot more to it, as nothing stands so solid and still. The catalog where that supposition would have applied in the first decade of the 21st century only got longer, including by then the Chinese even though bank reserves in China are still to this day applicably meaningful as money in ways they are not elsewhere. That is because the predicate position of Chinese money is “dollars” (or “euros”, “yen”, “francs”, etc.  ), a wholesale base upon which a traditional monetary format revolves. 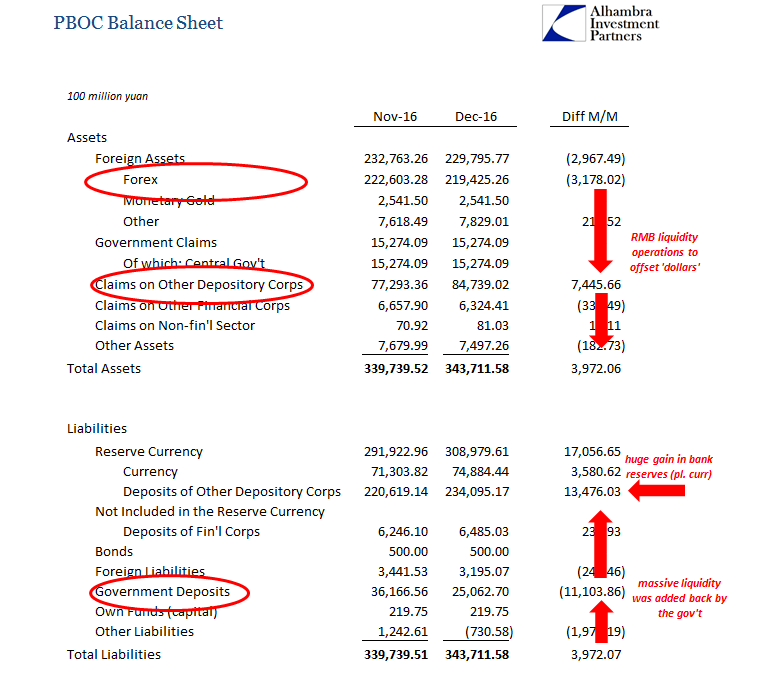 The entire monetary pillar of the People’s Bank of China is built around that part of its balance sheet. The stability (or instability) of the Chinese economy is in its monetary stability (or instability) as “dollar” expansion “backed” RMB expansion during the miracle. It was intended that would be the condition to which the Chinese would return after some amount of time following the Great “Recession.” To bridge that gap, the Chinese would have to appeal to RMB more than “dollars”, for the Great “Recession” itself was caused by an aggravated disruption of their global flow. 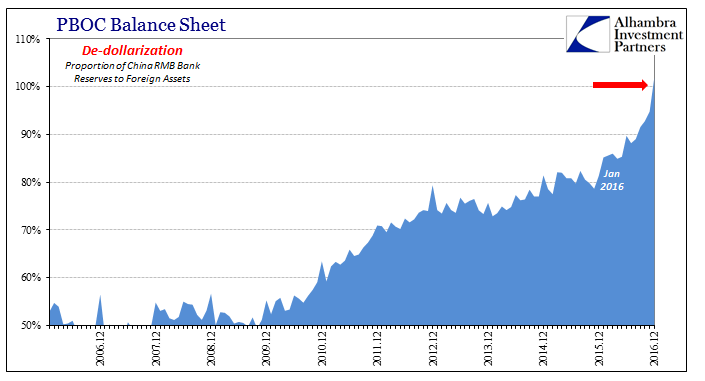 From late 2009 forward, bank reserves in China were more and more “backed” by less and less “dollars.” As the PBOC intended to fill the “dollar” gap through that period by RMB, internal monetary “stimulus”, the proportion of Chinese money that was nakedly fiat could only increase. In late 2009, the mix was about 50%, or, turning it around, 2 to 1; for every RMB in outstanding bank reserves (apart from actual RMB currency) there were 2 in forex “assets” of whatever composition. 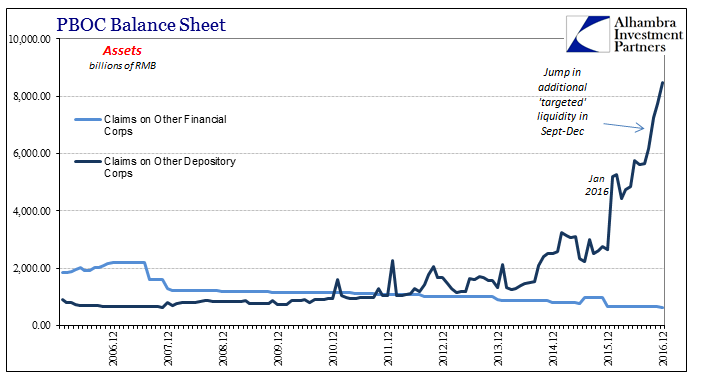 By the middle of 2013, the proportion was down to 75%, meaning 3 RMB in bank reserves for every 4 RMB in “dollars.” That ratio would remain steady until the “rising dollar.” As of the latest update for December 2016, bank reserves just cross the “unbacked” threshold for the first time, a massive shift just in 2016 alone. Economists will claim that this is not something to even consider let alone be concerned about. But those are the same economists who did not heed Friedman’s monetary warning no matter how many correlations fell apart (and all of the major one’s did long before 2008). What is important is not so much that RMB reserves are no longer “backed” by forex “dollars”, but that the PBOC has had to undertake extreme measures just to keep itself on a neutral stance. It is a fit of “money printing” that may have impressed Friedman (though I can never presume to speak on his behalf) but in the end falls far short of reaching any monetary goals. The “dollar” is much more than it. It displays on no uncertain terms just what the “rising dollar” has meant to China, and thus representative of the whole global dollar experience the past several years. It is not a “strong dollar” whereby the US could be the “cleanest dirty shirt”, nor is it really about the dollar’s relative exchange rate value against CNY, JPY, or whatever other major or minor. It is quite simply its absence, and the massive, unattractive consequences that creates. The Chinese are in fiat overdrive, and yet their money markets remain a disaster of volatility, driven first through what really isn’t currency. In December alone, total bank reserves surged by about RMB 1.35 trillion, partially as a result of continued heavy “targeted” liquidity (MLF, SLF, PSLF) but also the regular end-of-year drawdown of government deposit balances. Last year (2016) as the year before (2015), Chinese deposits with the PBOC declined enormously (by RMB 1.1 to 1.2 trillion) in predictable seasonal behavior (Golden Week). Since this was regular and expected, that meant the PBOC intended that monetary boost to be further amplified by its own unrelated efforts (primarily MLF). The Chinese can, of course, do whatever they wish to this continued effect; there is no gold standard to enforce balance upon them. However, this is not a consequence-free tradeoff; the more the PBOC attempts these internal offsets, the shakier the currency will become. Indeed, in this way what is going on in China money is reflective of (and reactive to) that external destabilization, with these internal factors (including redistribution effects) making the overall situation that much more potentially problematic. In other words, the issue isn’t so much that bank reserves are now “uncovered” but rather that the PBOC felt it needed to go to such extremes in rapid fashion. That desperation, as I would call it, filters out no matter how many times the media claims the PBOC has everything under control. The more the PBOC “has” to do, the more uncertain its monetary regime will be considered and even reflected in market activity, including that for the currency (as well as other markets, such as the unsettled even illiquid, at times, nature of Chinese stocks and bonds lately). 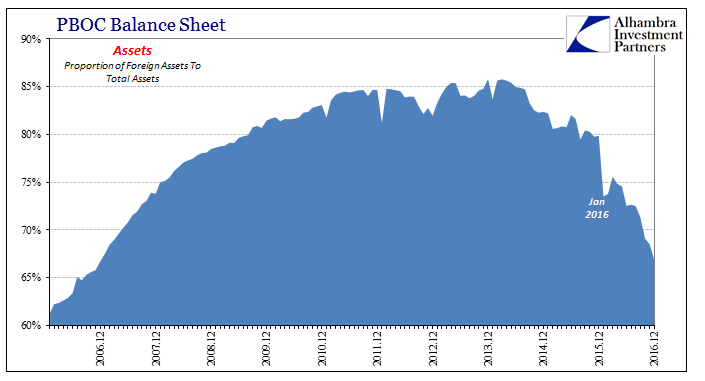 The comparison of reserves to the forex base is in reality a somewhat arbitrary standard, but it is still relevant to measuring the capacity of the Chinese in trying to offset what the “rising dollar” is and continues to be – their subverting absence. The world stopped paying attention to money and it has, as Milton Friedman predicted it would, turned around and surprised everyone. Most central bankers and economists still don’t even know it, though after nearly a decade of fighting it (and wasting the world’s precious time) they have been forced to finally come to terms with at least the contours of its economic consequences.